Order Jason Lavender Body Wash from the Online Health Food Store UK. Buy Jason Calming Lavender Body Wash - 887ml and other quality Bath & Shower safely online in the UK. This gentle JASÖN® Lavender Body Wash cleanses with natural botanical surfactants and safely nourishes with Vitamin E and Pro-Vitamin B5. This JASÖN® Lavender Shower Gel cleanses with natural botanical surfactants and safely nourishes with Vitamin E and Pro-Vitamin B5. Our natural blend of calming Lavender and Marigold (Calendula) Extracts relaxes your senses as it softens and balances your skin. As official Jason stockist in the UK, we sell quality Bath & Shower to customers throughout the UK in England, Wales, Scotland and Northern-Ireland. The JASÖN® brand is using only ingredients from natural resources. There are no artificial colours or animal by-products, the packaging is bio-degradable and packaged in recycled and/or recyclable containers. All products are certified Vegatarian, SLS Free, No Parabens, No Artificial Ingredients. View more products on the Online Health Food Store from Jason. Where to buy Jason Lavender Body Wash safely online? Shop at the Online Health Food Store if you are wondering where you can buy Jason Calming Lavender Body Wash - 887ml safely online in the United Kingdom. Our Health Shop is located in the UK and our award-winning independent has been serving customers in England, Wales, Scotland and Northern-Ireland since 1976. You can buy our Natural care products and other quality Bath & Shower online and we post out orders to any UK address. 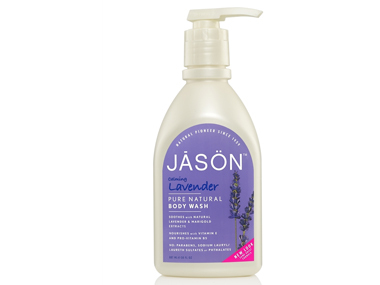 Lavender Body Wash - Jason Calming Lavender Body Wash - 887ml in Bath & Shower and Personal Care.